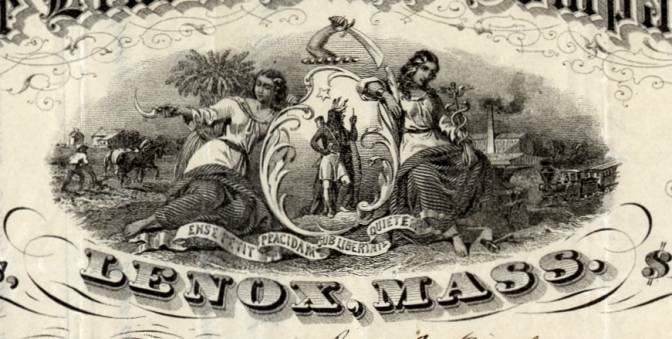 Beautiful certificate from the Lenox Glass Company issued in 1871. This historic document was printed by the Major & Knapp Company and has an ornate border around it with a vignette of the Massachusetts state seal. This item has the original signatures of the Company’s President, and Treasurer, and is over 141 years old. 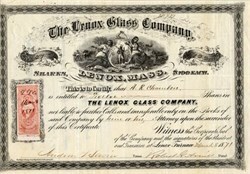 The Lenox Glass Company was incorporated in 1868 for the manufacture of cylinder or sheet glass. The Lenox Glass Company, was a very large concern with a large capital, and under it were consolidated both the Lenox Plate and the Lenox Crystal Companies, also a cryolite company from Philadelphia, hitherto known as the "Hot Cast Porcelain Company." The Lenox Glass Company attempted the polishing of plate and erected a fine building for this purpose. The company failed in 1872, and the property was sold and divided. The polishing works were bought by the Smith Paper Company, of Lee, and is now run by them as a paper mill. The cylinder or crystal works went into the hands of the Schanck estate, of New York, and the plate works to Mr. Theodore Rosevelt, of New York. Since the failure in 1872 the rough plate works have been run at intervals under a lease by Messrs. Servin & Averill, and by Mr. Servin alone, and are now run under a lease by Page, Harding & Co.